Stretch Your Budget with Kraft Recycled Grocery Bags at The Lowest Possible Price! 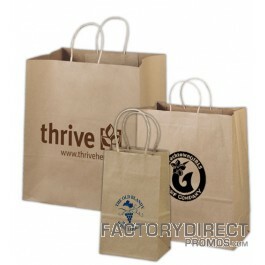 If you need custom branded bags for your business consider using Kraft recycled grocery bags. These bags are a convenience item that allows customers to carry items home, and can fit into your branding plan. High-end Kraft recycled grocery bags can be customized with your branding information, can be used several times, and are eco-friendly marketing tools. Kraft recycled grocery bags are ideal for retail businesses, restaurants, spas, and more. Kraft recycled paper bags are made from recycled content paper, which makes them a great eco-friendly choice. Paper bags can be used several times, and once they have fulfilled their usefulness they can be recycled. Unlike plastic bags, all recycling programs accept paper bags, making them extremely easy to recycle. Kraft recycled grocery bags come in a variety of sizes, so you can select the size that works best for your brand, and how your customers will use the bag. Have your branding information printed directly on the bag to turn it into a marketing tool. When your customers carry their purchases in your branded grocery bags, they will spread your branding message to everyone they encounter. If your customers repurpose your branded bag for future use, they will give your brand even more exposure. For over 20 years we have been helping businesses like yours effectively market their goods and services with eco-friendly bags. We not only offer the best possible pricing on Kraft recycled grocery bags, we offer the ability to help you rest easy and know you are in good hands. We understand you have a lot of choices out there and we are here to make the process easy. Contact us today or fill out a quote request and we will get started creating your one-of-a-kind Kraft recycled grocery bags.